The Gion Matsuri, which takes place for the entire month of July, is one of the three main Kyoto festivals. The event draws many thousands of spectators from all over who come to watch the daily religious parades held throughout the streets of this small cultural city. Here we will tell you more about this important – yet fun, cultural event and the best way for you to experience it. Video is owned and created by kota2chan. The Gion Matsuri is a purification ritual which started 1,200 years ago – making it not only one of Japan’s biggest but also oldest celebrated festivals. The festivities kicks off on the 1st July and ends on the 31st July. However, the Yamaboko Junkō parades, which fall on the 17th and 24th, are the only 2 major processions you don’t want to miss. The lively atmosphere and incredible floats of these 2 days are sure to create a memorable experience. One can actually feel the excitement and anticipation building up in the days leading up to the Yamaboko Junkō. The day prior (16th / 23d July) is known as yoiyama, 2 days before (15th / 22nd July) is yoiyoiyama and 3 days before (14th / 21st July) is called yoiyoiyoiyama. On the 1st July, the participating Kyoto neighborhoods will have the opening ceremonies. These ceremonies take place by parading small, portable Shinto shrines known as Mikoshi through the streets. This symbolizes the arrival of the spirits and is repeated again on the 31st July to bid them farewell before they return to their world. Construction of the floats starts on the 10th of July. They are built entirely from wood and rope – no nails whatsoever! Each year they are built from scratch and no float from the previous year may be reused. Floats are beautifully decorated with items such as tapestries, lanterns and tassels. Yama: The Yama floats translate to ‘Mountains’ and are the smaller of the two varieties. They can also be recognized by a pine tree which sits on the top which serves as a connector to the Heavenly Element. Because of the Yama’s smaller size they are usually carried by a group of men with wooden supports. Hoko: The word translates to ‘halberd’ and are larger floats usually consisting of two stories. These roll on wheels and are pulled by groups of men by means of thick ropes. Hoko’s are also more elaborately decorated. All floats are collectively known as Yamaboko. The history behind this festival is nothing short of interesting. Also, its important to understand the reason and meaning behind how and why it was started in the first place. Kyoto, during the Heian era (794-1185), was a period of regular catastrophes. There were frequent earthquakes and summer time plaques caused by hot weather and rain so as a solution Emperor Seiwa ordered the city to pray to the Shinto gods. People gathered in the Gion District of Kyoto at the Yasaka Shrine with 66 halberds (one for each of the 66 Japanese provinces) as a way to supplicate the gods who were causing the catastrophes. The Emperor’s plan worked but the catastrophes returned again in the 9th century. The ritual was repeated and by the year 970 it became an annual event which continues to this very day as the Gion Matsuri festival. Throughout the centuries this purification ritual, which started out with halberds, eventually got replaced with the heavy wooden floats you will see being paraded down the streets today. Each year’s schedule may be slightly different but the table below will provide you with a common chronological order of the most important events. The opening ceremonies are held in each participating Kyoto neighborhood. These events marks the arrival of the spirits and are celebrated by parading small portable shrines, known as mikoshi, through the streets. The lottery, known in Japanese as ‘Kujitorishiki’, is where they randomly select the order of the floats for the processions. The event takes place at the Kyoto Municipal Hall. To attend, send them a reply postcard, and if you get selected you will be invited to the event. The 10th of July has 2 important events. The first being the Mikoshi Arai, which is where children carry small shrines across the Kamo River, where Shinto priests will purify them. The second event is the Lantern Reception, known as the Omukae Chochin. The event consists of young girls doing the Sagi Odori and Komachi Odori dances. You can watch as 23 floats for the main 17th July processions are being built. Construction and testing takes place on Shijo and Muromachi Street. If you are feeling particularly strong, you can help carry and pull them during the testing phase. On the evenings of the 14th, 15th and 16th July the streets are closed to vehicles and people will come out to celebrate in anticipation of the main procession. There will be stalls selling food and drinks; as well as game stalls. These three nights are called the yoiyama, yoiyoiyama and yoiyoiyoiyama. The main procession everyone has been waiting for starts at 9am. The 23 floats will move along the predetermined route and will end when the last float has completed its journey. And just when you thought the fun was over! Over these couple of days the second set of floats are constructed and tested for the next main procession This time only 10 are built as opposed to the last 23. The second round of evening Saki Matsuri celebrations takes place again in anticipation of the next main event. July 24th is when the second main procession occurs. At 9am the ten floats constructed over the last few days will be paraded once again on a predetermined route. The event is over when the last float completes the route. Floats are immediately dismantled the day after the final procession in order to prevent diseases gathered during the procession from spreading. The Summer Purification Ritual signifies the end of the Gion Matsuri festivities. Everyone gathers at the Yasaka Shrine where a Shinto priest will bless everyone who partook in the festival. When the blessings are done the general community can walk through a sacred ring made from reeds in order to be blessed as well. Entrance to the festivities are free so expect a lot of people to attend. It’s best to pick a good spot from where to watch the processions and keep a close eye on your kids if you have, as well as your belongings. Report any problems to the nearest security officer – there are many and they are always visible. 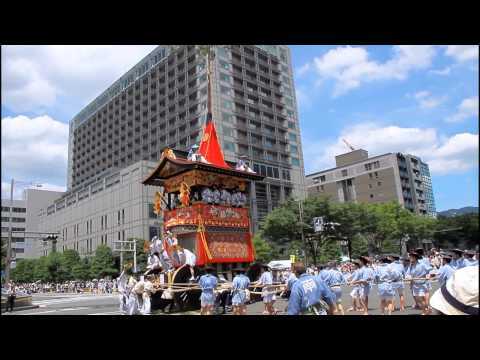 The Gion Matsuri Festival takes place during the summer month of July so it gets extremely hot. It is therefore advised you bring sunblock and a hat to minimize sunburn. It’s also important to stay hydrated and fortunately there are a lot of stores and vendors who sell bottled water. Japanese summer months bring with it a lot of rain which usually occurs in the late afternoons. Processions keep going in most cases despite the rain so it might be a good idea to bring an umbrella with if you choose to stay or get unexpectedly caught in a rain shower. The Gion Matsuri Festival starts and ends at the Yasuka Shrine. Read more about this important religious Shinto site here. Regular participants of Gion Matsuri have set up a website explaining the event. Find out more about it from their website here.